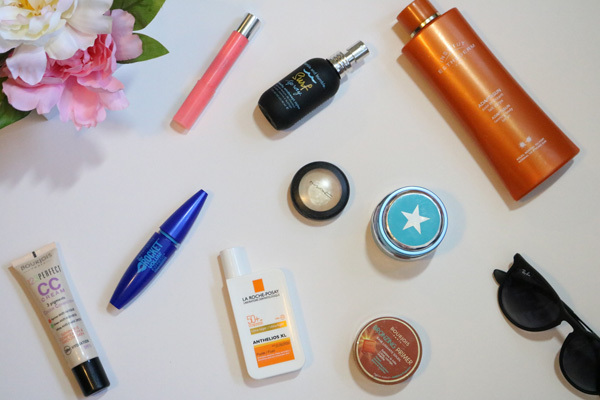 It goes without saying that the most important products in my make up bag have been SPF. My go to body sun protection for the last couple of years has been the Institut Estherderm Adaptasun Tanning Body Lotion. Although this is quite a pricy product, when it comes to protecting my skin from the sun, I like to go the extra mile. This suncream allows my skin to develop a really nice colour but still protects my skin, and the company has a really interesting philosophy when it comes to sun protection, their products being marketed in terms of the strength of the sun instead of an SPF number. For facial suncream, this year I have been really loving the La Roche Posay Anthelios XL Ultra-Light Fluid SPF 50. This is an incredibly thin liquid that is really easy to apply on the skin, which is particularly good for an SPF 50. This sits really well under makeup and you can barely detect it on the skin; this is possibly the best facial sunscreen I have ever come across. In terms of base, the GlamGlow Thirstymud Mask was an essential when it came to in-flight skincare. I mentioned in my New York In Flight post that I like to continue to apply this throughout the course of a flight in order to prevent my skin from drying out on the plane. The flight to Indonesia was 14 hours so I definitely needed help in the hydration department. For days that I wanted a little bit of coverage on my skin (mainly in the evenings) I reached for my Bourjois 123 Perfect CC Cream (full review here). This is a great light base that has buildable coverage and a gorgeous dewy finish. For added colour to the skin, I found that the Bourjois Bronzing Primer was a really quick and easy step. It is a creamy mousse bronzer that can be applied with fingers if necessary, perfect for quick summer makeup. It is not too orange or too grey, and for my skin tone is a perfect shade to bronze up the skin. I also love to add a glow to my skin the summer, and the Mac Cream Colour Base in Pearl is another great product. Like the Bourjois, it can added quickly to the high points of the face with fingers. It is a light pearly gold colour, which catches the light beautifully, creating a gorgeous candlelit glow on the face. Due to having relatively fair-haired lashes, I am still one to like to wear mascara on a regular basis in the summer. I like to opt for a waterproof formula, so I decided to pick up the Maybelline The Rocket Waterproof Mascara. While this is great for its waterproof qualities, I wouldn’t say that this is the best performing mascara that I have. It gives good definition, but it does not give too much length or volume. This does however make this a favourable day time option. I also find it important to ensure that I protect my lips from the sun as they tend burn really easily. I recently picked up the Bourjois Colour boost Lip Crayon in Peach on the Beach which is a really pretty pinky peach shade. I love that it has SPF 15 in, and this is specifically the reason that I took it to Bali with me. That rounds up the current products I am loving for the hot weather, and if we’re lucky Britain may get a little bit more before the summer passes us by. What are you summer staples? Fab post, some gorgeous picks. Ooh did you have a good time in Bali? I really love the Bourjois CC Cream such a good base for a high street brand 🙂 For the summer I love my Benefit Bella Bamba blusher just so sad that it has been discontinued.